While I wait to have the vertical stabilizer inspected by the EAA technical counselor, I decided to begin the rudder. One of the stiffeners is on back order from vans. When I called they said they’d send it out immediately. I’ve been very happy with vans support in the kit shipment, delivery, and in technical assistance. As a new builder, it’s comforting to know that they provide phone support backed up with warehouse full of extra parts. The first page involves a lot of singulating, trimming, and deburring. I was able to use the snips for most of this work followed by lots of scotch-brite wheel trimming and buffing. I find that the wheel is great a deburring and removing small tabs or jagged edges. I’ve formed a groove in the wheel which is nice slot to run the edges through in one pass. 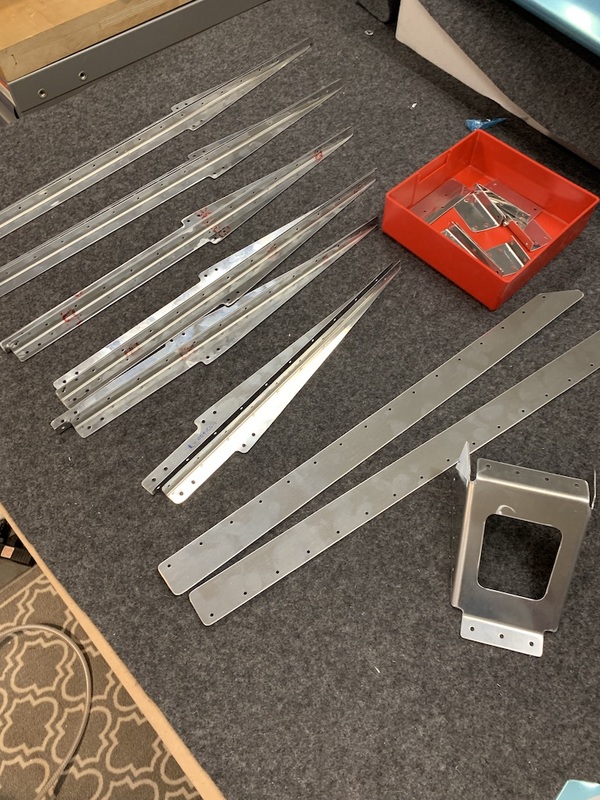 Continued to prep parts for the rudder including trimming the remaining 915 stiffeners, separating the bottom rib (904-A) and radiusing the edges of the rudder horn (405PD). In all of these cases the workflow that I used was to use the snips or band saw to trim, then the scotch-brite wheel to deburr and polish the large edges, and finally a combination of small files and emery cloth to deburr the small corners and edges. Finished locating, trimming, and deburring all the parts. The next step instructs to assemble the reinforcement plates, the rudder horn and the bottom rib and final drill common holes to #30. After the clecoing, I spend some time planning the next steps.